This range was first introduced in 2003 to meet the ever-increasing consumer demand for premium gourmet products that provide excellence in quality with innovative flavour concepts and packaging. This range offers you rich full flavoured combinations encased in the very best of pastry. 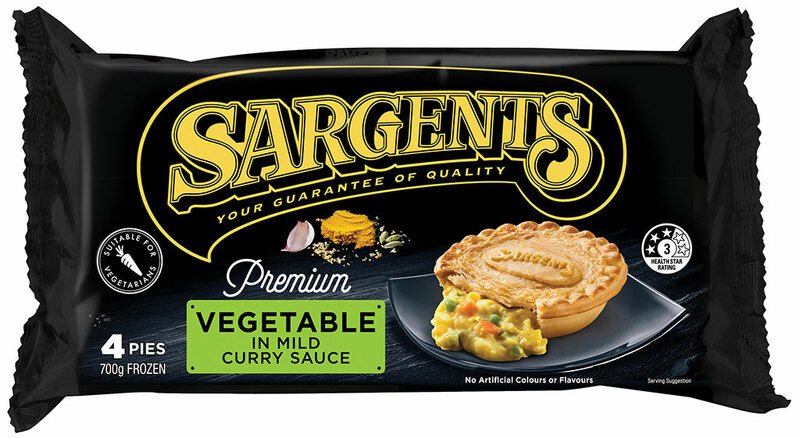 Premium vegetable pieces in a flavourful pie for a meat free option. Water, vegetables (29%)(potato, carrots, green beans, peas, broccoli stems, corn, onion), wheat flour, margarine (vegetable fat & oil (palm), water, salt, emulsifiers (471, 322 - soy), antioxidants (304, 307b - soy), acidity regulator (330), natural flavour, natural colour (160a)), coconut milk powder (milk), thickener (1422), salt, mild curry powder (0.4%), flavour (yeast extract), onion powder, dextrose, garlic powder, pastry glaze (milk, sugar, natural colour (160a)). Allergen information: Contains: wheat, soy & milk products.